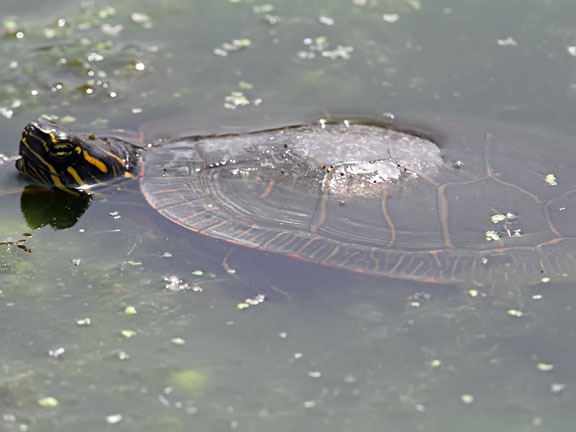 The painted turtle is the most common turtle found in North America. One of the main reasons is because of their ability to live in areas that have been disturbed by people. Turtle eggs and young are very vulnerable to predation but adult turtles, with their hard shell, have very few predators to worry about. In the wild turtles can live over 50 years but unfortunately many do not make it to that age because of cars. Although they breath air through their lungs, like we do, they are mostly aquatic creatures. 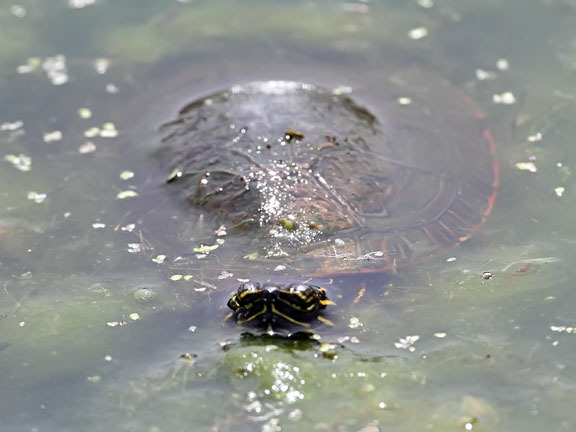 Painted turtles spend most of their life in the water. With their webbed feet turtles are excellent swimmers and spend much of their time hunting aquatic insects, fish, frogs and crustaceans. Since they are omnivores they also eat algae and other aquatic vegetation. The smaller males usually only leave the water to sun. Since they can not regulate their own body temperature they need to sit out in the sun to warm themselves up. Usually their sunning spot is close to the water in case a quick escape is necessary. The larger females also sun but will also leave the water around the beginning of summer to dig a nest and lay their eggs. These are usually the turtles that are hit by cars, especially on dirt roads where they may be digging the nest. Nice photos of the turtles (partially) under water. We definitely saw a few of them growing up (just outside New York City) and even adopted one for a few days before releasing it back into the wild.